Creating your New Home doesn’t need to be difficult, and it certainly doesn’t need to be stressful! We want you to have an exceptional result and an incredible journey. As experienced specialists in quality high performing homes, we know what we are talking about! You can be confident we have the skills, knowledge and experience to take your new home from conception to an exceptional quality home that performs well above the minimum building code. Let us take you on your own amazing journey and leave you with an exceptional souvenir – your dream home! Watch our short video and hear a few words from Brent Chatterton, owner of Chatterton Builders. We can provide the full range of services catering for any stage of the building and design process. It does not matter what stage of the building process you are at we have the staff and experience to assist you to get what you want , whether you need us to assist you with a design or you have plans supplied by your own architect. Design Build is our bread and butter work. After listening to your needs we can work together to identify the Designer that best meets those needs. We, as the builder, can ensure the design works for you and your budget is considered in all design decisions. This avenue provides the best result for your buck as the whole team (client, builder & designer) has clear goals and constraints to work with from the start. We have evolved into becoming an authority in Structural Insulated Panel construction. With over 10 years experience, and staff fully trained in its assembly and install, we understand what is required in both design and construction, and you get the best advice and expertise out there. Our indoor panel assembly plant is also a hit with homeowners and builders alike who utilize our plant, and skilled team, to reduce weather delays and enable a more efficient build process right through to on site install, which often means those panels transported are also installed the same day. Through years of working with SIPs our desire to provide warmer healthier homes for our clients has grown. Our expertise in the design and build of high performing energy efficient homes has produced successful outcomes for a wide range of client demands and priorities. There is not one size fits all. Understanding your needs, priorities and budget, alongside a detailed understanding of the building science and practicalities, is what sets us apart from many others claiming to do the same. Our Plan Range is another great tool providing ideas, and importantly a price guide to work to. As each house is unique these plans can be easily tweaked to suit a family’s needs, and level of energy efficiency required. Each client is unique with differing needs, concerns and knowledge. What we do is listen and tailor our services, in agreement with you the client, to meet your requirements and your lifestyle commitments. We take into account your aspirations, ideas, available time, interests, desired involvement and knowledge and work to achieve a balance that is right for the individual client. One process does not fit all! Too many questions or not enough information? Expectations invariably differ from one person to the next. Misunderstood communication expectations or even worse, ignorance, is not what you, the client, wants or needs! The Builder can certainly make or break your home building experience. We recognise that communication needs and preferred avenues are also unique. Therefore, the communication avenues we use can also be tailored to the unique needs of the client. Our online system whilst enabling information sharing 24/7 also allows conversations to be followed, emails to be tracked, schedules to be updated and photos to be posted, among other things it certainly helps you, the client, to feel more a part of it even if you can’t get to site very often. And as for more personal, traditional forms of communication we embrace this too and believe a balanced approach is definitely preferable for a productive relationship – read on for more on this. How many times have you wanted to get an answer to something or assistance with a problem and you don’t know who to call, you get transferred from one person to another, or worse still no one gets back to you? We have dedicated staff who are available to assist you or answer your questions at each stage of the process, plus our Office Administrator based at our offices in Rangiora will ensure any messages get to the right person. We don’t juggle building work with project management and sales – we each have a role and are accountable for it, and this includes excellent communication with our clients. As an experienced builder Brent will work alongside you and your designer or architect during the potentially daunting stage of design, pricing and eventually contract signing. All our clients rave about Brent’s knowledge, integrity and approachability. Why not make the most of his vast experience? Our Client Liaison is also another port of call assisting you with your choices of products and materials during the selection stage. We attend important supplier meetings with you to ensure we have a shared understanding of the important matters and answer any questions to help facilitate the process. Our dedicated Project Manager is available to discuss how your project is going throughout the build if you prefer a face to face catch up or phone call – it’s all about what suits you and what makes you feel comfortable we are delivering you the result you want. See here for our full range of our services. How many houses do you see which, 5 – 10 years after they were built, start looking shabby, scruffy and past their best? There are many reasons for this, namely poor workmanship and use of sub-standard products. Did you check the paint used was actually a reputable brand and not a cheap version? You probably didn’t and neither should you have to! We believe all homes should be built, not for move in day, but for years and years to come. Quality workmanship and quality tested materials truly come to the fore when it comes to the time test! We will never cut corners. All our houses still look great today – we want you to have a home that look amazing for many many years to come. We also provide you with all the warranty information in a handy pack so you have all the information to enable you to maintain your home as per the warranty requirements. It is important to find out about your responsibilities for maintenance during the lifetime of the product before building, as you may want to consider the impact this will have on future time and cost. Who is working on your job and how qualified are they? We identify the best staff to complete your home – some are more specialised in highly engineered builds and others love the craftsmanship of traditional styled homes, all of our staff, however, are great builders and have a lot of experience. We have also trained many of our builders in the specialist field of construction using passive house principals. 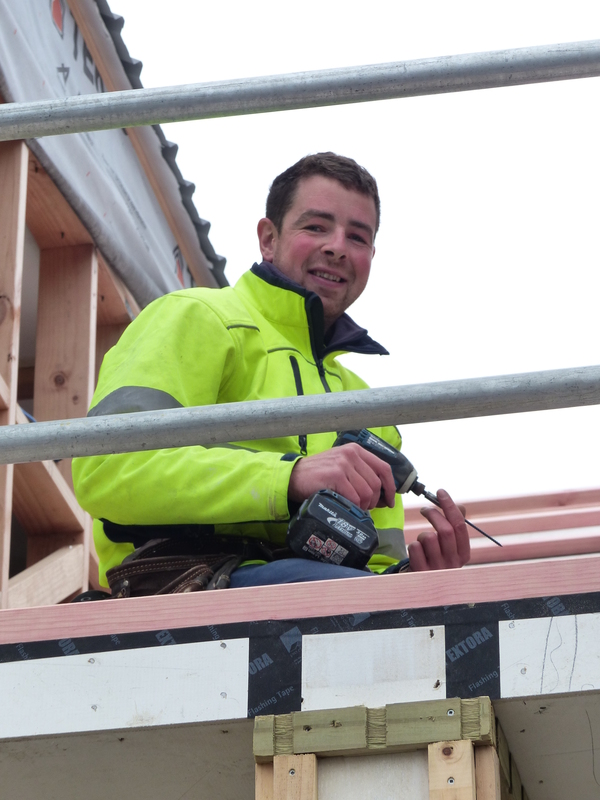 Brent and Ciaran are only two of a handful of Passive House Certified Tradespeople in New Zealand. By the specialist teams building up experience in this field it ensures success, efficiency and ongoing development for all levels of high performing and energy efficient builds. This also extends to our sub-contractors. We use the same ones for all our high performance and energy efficient homes to ensure they understand the concept, we avoid delays due to inexperience or mistakes, and they know what they can and cant do, for example, ensuring the airtight envelope is not compromised. It also provides extra quality assurances for the client. We employ apprentices but unlike many other building companies we limit it so there are always more qualified builders on site than apprentices (this means higher quality and they are able to learn more too). We provide you with details of the main building staff working on your home prior to the build for your information. In some instances we may send further staff to your site when additional/specialist assistance is needed. All builds are overseen by our Project Manager, an extremely experienced builder himself. He also oversees the building schedule and the sub-contractors and suppliers. Everyone on site must work to our Company Policy, and our Health and Safety Policies. This ultimately leads to a safe, tidy and productive work site. To find out more about Chatterton Builders and how they will ensure your project is a huge success, click here or on the brochure below!